Some of my time since the last post has been working on a different kind of post, making mortise and tenon joints in vertical “posts” and horizontal cross pieces, frames for storage spaces in my cellar workshop. Mostly, I putter. Sometimes I get the itch to do more. A recent rain storm was the impetus for getting to it. The last few years, heavy rains have gotten into the cellar. One old case I inherited from the time I worked at the Radio Shack store at the corner of Route 9 and Oak Street in Natick got wet. The case was cheap construction with carpet stapled and glued onto fiberboard. Wet fiberboard made the case tilt over. I had to remove everything I had stored in it and tear it apart. I’ve been working on replacing it. In the past, I’ve just cut half lap joints in the ends of 2×4 stock to make the case/shelf frames. I’ve reinforced them with carriage bolts. 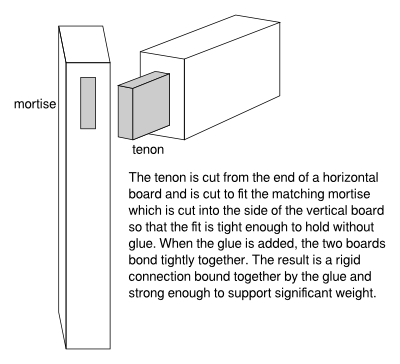 This time, I decided to try a more challenging joint, the mortise and tenon. I’ve been watching videos on Youtube by Paul Sellers, a master woodworker. He uses hand tools in the way he himself was taught. I’ve been trying to do the joints by hand with chisels, hand saws and such. I’m not very good at it. I am hoping to practice enough to be good by the time I finish the 2×4 frame. Part of my time has been spent learning to sharpen the chisels and that, too is challenging. I have shaky hands which does not help keeping the required constant, flat contact with the sharpening materials. I am pretty sure that my chisels are not so sharp as those used by Paul Sellers or the other people whose work I envy.